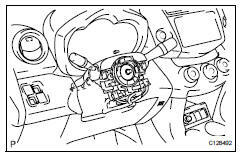 Some of these service operations affect the srs airbag system. 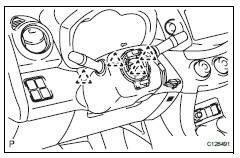 Read the precautionary notices concerning the srs airbag system before servicing the steering column (see page rs-1). 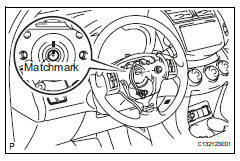 Remove the nut and place matchmarks on the steering wheel and steering column. 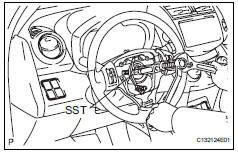 Using sst, remove the steering wheel. 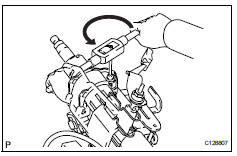 Apply a small amount of grease to the threads and tip of sst (center bolt) before use. Detach the 4 claws, release the tilt lever and remove the lower steering column cover. Detach the claw and remove the upper steering column cover. Disconnect all connectors from the turn signal switch with spiral cable. 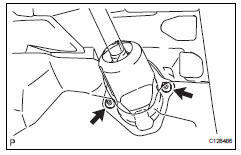 Detach the clamp shown in the illustration and remove the combination switch from the steering column. 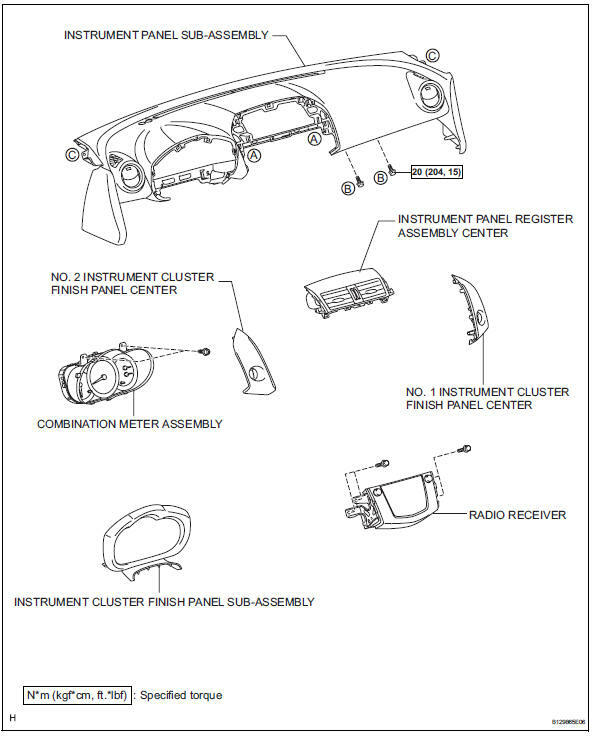 Remove the instrument panel (see page ip-4). 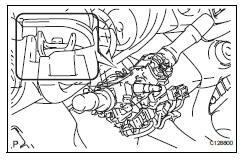 Detach the power steering motor wire harness and torque sensor wire harness clamps from the power steering ecu side. 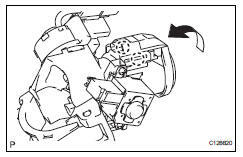 Disconnect the 2 steering column connectors from the power steering ecu. Turn back the floor carpet, remove the 2 clips and remove the column hole cover silencer sheet. 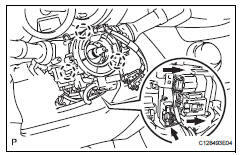 Remove bolt a and detach the steering assembly from the steering gear. 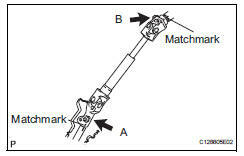 Place matchmarks on the steering intermediate shaft and steering column. 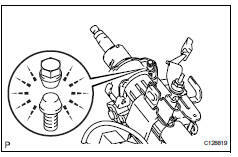 Remove bolt b and detach the steering intermediate shaft shaft from the steering column. 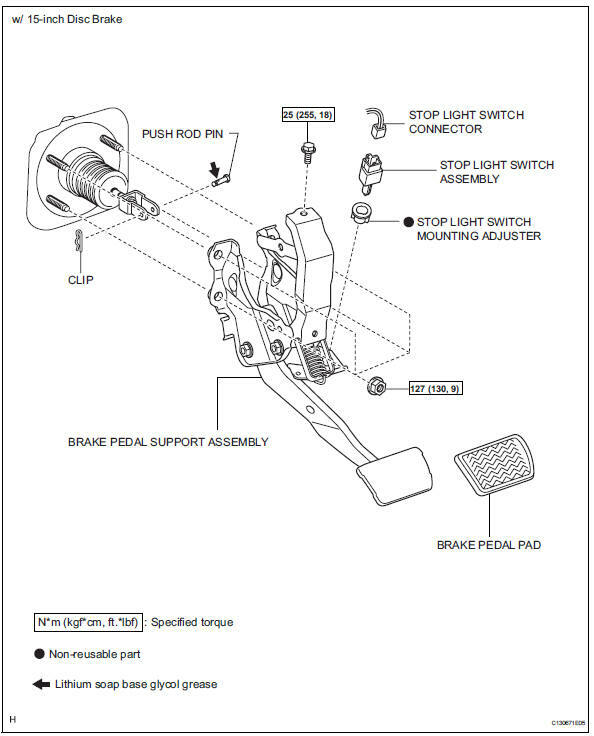 Remove the brake pedal support (see page br-12). Disconnect all connectors and detach all wire harness clamps from the steering column. Remove the bolt and 2 nuts and remove the steering column from the instrument panel reinforcement. 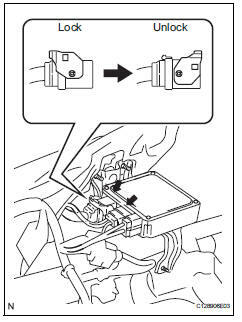 Detach the 2 claws and slide the transponder key amplifier in the direction shown in the illustration, to detach it from the steering column upper with switch bracket. Fix the steering post in a vise between aluminum plates. Using a drill, drill a hole in each of the steering lock set bolt to insert a screw extractor. 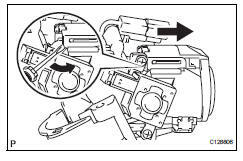 Using a screw extractor, remove the steering lock set bolt and remove the steering column upper with switch bracket and steering column clamp upper. 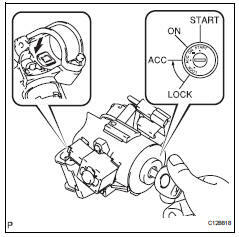 Turn the ignition switch to on (acc). Insert the tip of a screwdriver into the hole in the steering column bracket upper, as shown in the illustration, and pull the ignition switch lock cylinder out until its claw comes into contact with the stopper of the steering column bracket upper. 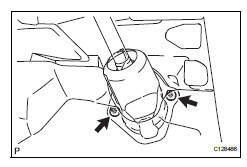 Pull the ignition switch lock cylinder assembly out until its claw comes into contact with the stopper of the steering column bracket assembly upper. Otherwise, the following procedure cannot be conducted properly. 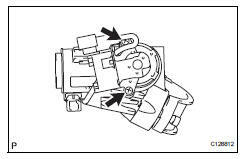 Insert the tip of a screwdriver into the hole in the steering column bracket and tilt it downward, as shown in the illustration, to disengage the claw of the ignition switch lock cylinder. 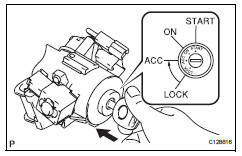 Then pull out the ignition switch lock cylinder. push up the unlock warning switch center portion to disengage the 2 claws. Slide the unlock warning switch in the direction shown by the arrow in the illustration to remove it. Remove the 2 screws and remove the key interlock solenoid from the steering column bracket upper. 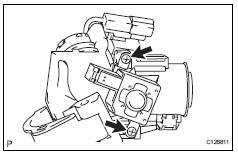 Detach the 2 claws and remove the ignition (starter) switch from the steering column bracket upper. 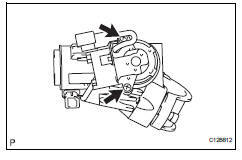 Check the torque sensor (see page ps-19). Check the power steering motor (see page ps-22). Check the motor rotation angle sensor (see page ps-25). Attach the 2 claws to install the ignition switch onto the steering column bracket upper. 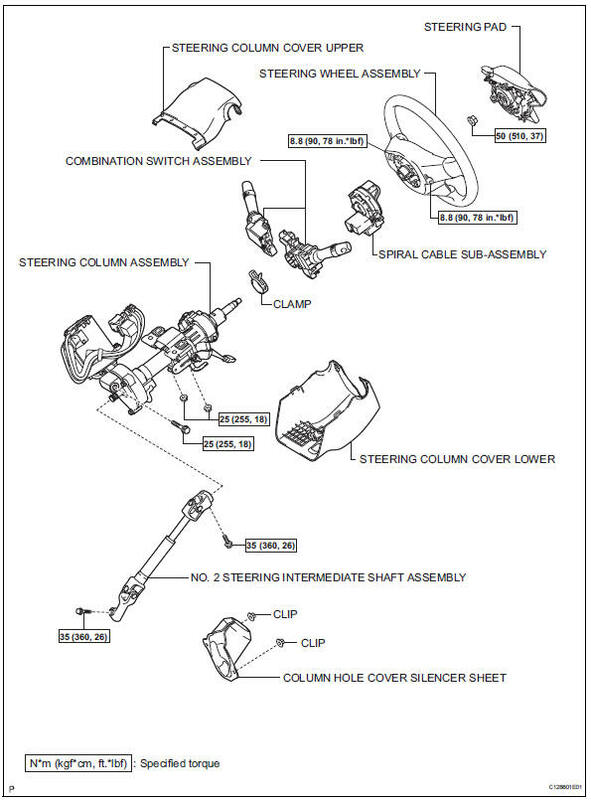 Install the key interlock solenoid onto the steering column bracket upper with the 2 screws. 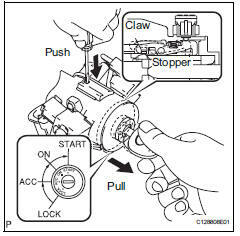 Attach the 2 claws to install the unlock warning switch onto the steering column bracket upper. Slide the unlock warning switch in the direction shown by the arrow in the illustration to install it. 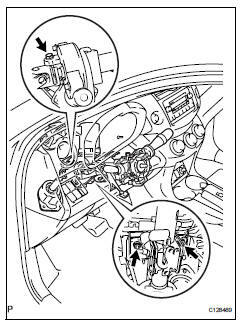 Install the ignition switch lock cylinder into the steering column bracket upper. 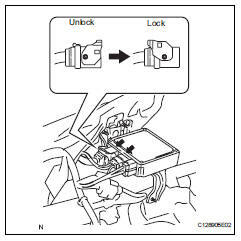 Make sure that the ignition switch lock cylinder is securely fixed onto the ignition switch lock cylinder. Remove the key and check that the steering lock function is activated. 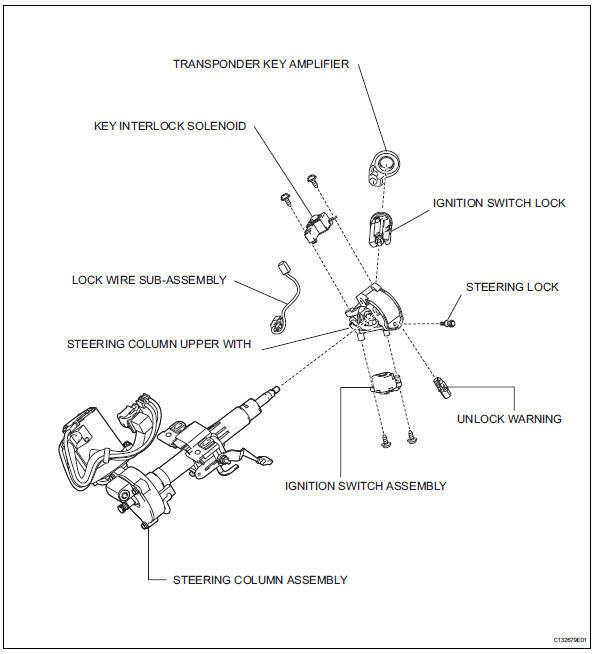 Insert the key, turn the ignition switch on (acc) and check that the steering lock function is deactivated. Fix the steering column assembly in a vise between aluminum plates. Install the steering column upper with switch bracket and steering column clamp upper with new steering lock set bolt, and then tighten the bolts until their heads come off. Attach the 2 claws and install the transponder key amplifier onto the steering column upper with the switch bracket. 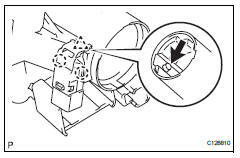 Install the steering column onto the instrument panel reinforcement with the 3 bolts. Connect all the connectors and clamp the wire harnesses onto the steering column bracket. 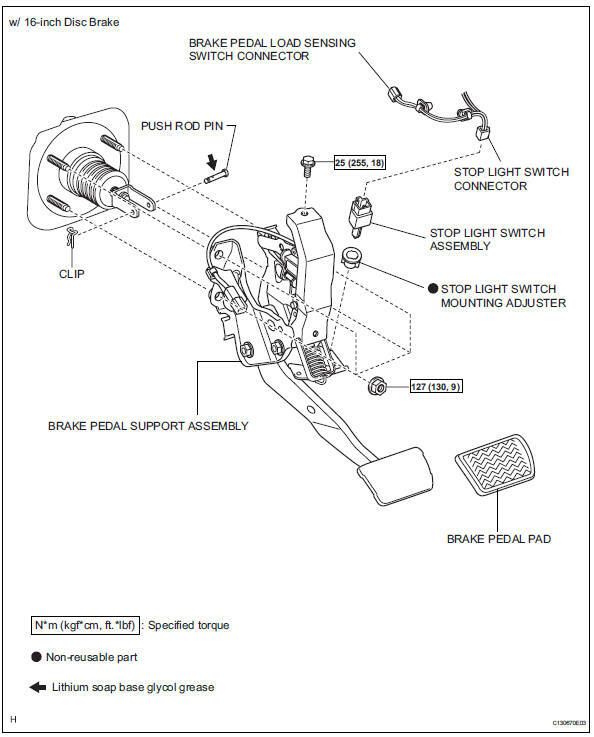 Install the brake pedal support (see page br-16). 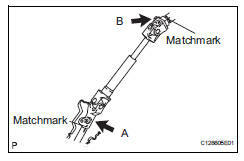 Align the matchmarks on steering intermediate shaft and the steering sliding yoke and temporarily install them with bolt b.
Align the matchmarks on the steering sliding yoke and steering gear and install them with bolt a. Install the column hole cover plate with the 2 clips. Connect the 2 steering column connectors to the power steering ecu. 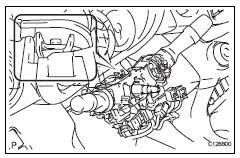 Install the power steering motor wire harness and torque sensor wire harness clamps onto the side of the power steering ecu. Tilt the steering column assembly up and down to make sure that the power steering motor wire harness and torque sensor wire harness do not interfere with any components. 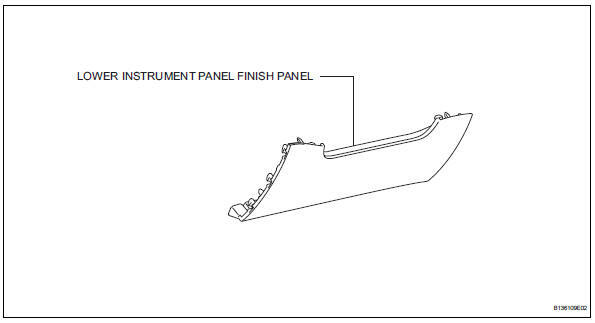 Install the instrument panel (see page ip-9). Install the turn signal switch onto the steering column with the clamp. Install the spiral cable onto the turn signal switch. Connect all the connectors to the turn signal switch with spiral cable. 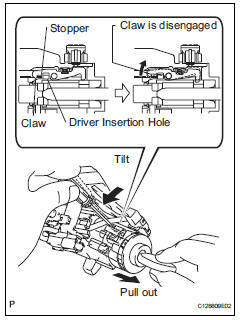 Attach the claw to install the upper steering column cover. Attach the 4 claws to install the lower steering column cover. 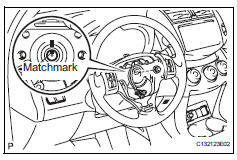 Align the matchmarks and install the steering wheel onto the steering column. Connect all the connectors to the spiral cable. 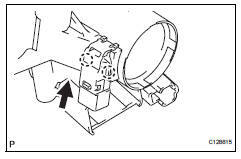 Inspect the srs warning light (see page rs-52).